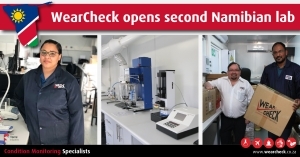 WearCheck’s newest laboratory is officially open in southern Namibia, bringing to 16 the number of laboratories that we operate in nine countries around Africa and beyond. Situated at Skorpion Zinc mine near Rosh Pinah, the new lab is strategically placed to answer a growing call for world class condition monitoring services in the region, particularly in the burgeoning mining and construction industries. The lab is open to any industry requiring used oil analysis and other reliability solutions services. It is fully equipped with the latest instruments and technology and is backed by its own uninterrupted power supply. To enable maintenance managers to make quick decisions, the lab offers 24-hour sample turnaround time. A second Namibian WearCheck laboratory has provided condition monitoring services to the Husab Uranium Project since 2016. Swakop Uranium, owners of the mining operation, awarded WearCheck a contract to supply and operate an on-site laboratory. WearCheck MD Neil Robinson is determined to make world class condition monitoring services as accessible as possible to industrial operations on the African continent. ‘The learning curve for equipping and operating a remote laboratory has been a steep one, however every project is a learning experience and with each new laboratory, the implementation process is bettered. 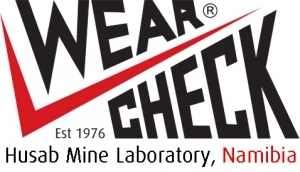 Offering a wide range of condition monitoring services for the mining sector - including used oil analysis - WearCheck Namibia is available for use by other industries, such as quarrying, industrial, transport, power generation and shipping operations. In addition to two in Namibia, WearCheck’s labs can be found in South Africa (six), Zambia (two) and one each in Zimbabwe, DRC, Mozambique, Ghana, Dubai and India. WearCheck Namibia is open for business! Laboratory manager Leandra Smith is standing by to process used oil samples and other condition monitoring services for industrial operations in the southern Namibia region. The instruments for WearCheck’s newest laboratory are carefully packed and secured before transportation from Durban to Namibia. Diagnostic manager John Evans (left) and laboratory manager Meshach Govender conduct a final inspection before the boxes left Durban. Namibia’s Husab Uranium Project – a mining operation that is owned by Swakop Uranium – awarded WearCheck a 5-year contract to supply and operate an on-site laboratory, which opened recently. The on-site laboratory boasts a full complement of instruments, and provides Husab with services such as oil analysis and a wide spectrum of reliability solutions services. As an open-pit mining operation, Husab uses the conventional truck and shovel mining method. The on-site laboratory is well-placed to maintain the plant used in this process - including a huge scale of loading and hauling equipment - at optimum output capacity. The laboratory was set up as part of a joint venture with sister company, Set Point Laboratories, who built and supplied the assay side of the laboratory. Husab Mine is situated 45km from Walvis Bay, and when it reaches full production capacity of around 7 000 t of uranium, it will be the second largest uranium mine globally. WearCheck managing director Neil Robinson attended the official opening of Husab’s oil analysis laboratory in Namibia. Here, he outlines how the on-site laboratory will boost plant performance. The brand new oil analysis laboratory at Husab, Swakop Uranium, is kitted out with the full complement of laboratory instruments.